The Bank of England’s Funding for Lending scheme isn’t boosting bank credit. A rumoured ECB version will likewise fail to spur a massive wave of lending if demand is weak. But a round of credit easing that cuts elevated peripheral bank funding costs would still be worth a try. 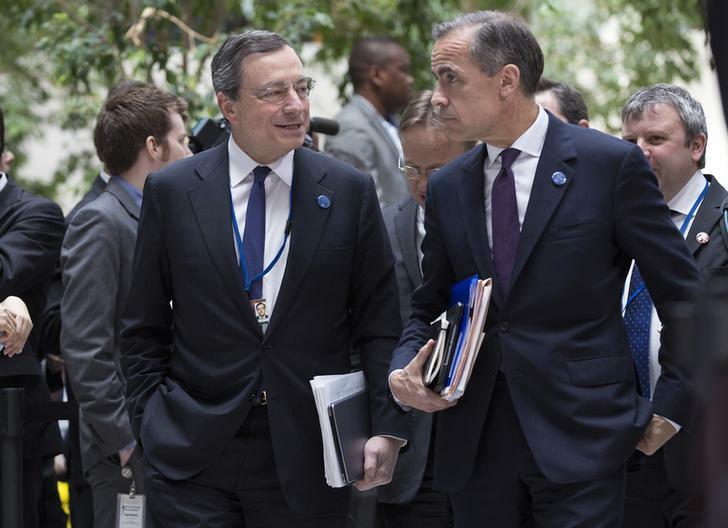 European Central Bank President Mario Draghi (L) and Governor of the Bank of England Mark Carney talk before the G20 finance ministers and central bankers family portrait during the IMF/World Bank 2014 Spring Meeting in Washington April 11, 2014. Net lending to businesses under the government’s Funding for Lending scheme fell 2.7 billion pounds in the first quarter of 2014, the Bank of England said on May 29. The BoE found that the fall was focused on lending to large companies: net lending to small and medium-sized enterprises fell 0.7 billion pounds. There was also a decline in net lending to businesses in the real estate sector. Measures of average bank retail and wholesale funding costs have fallen by up to 200 basis points since the launch of the FLS in July 2012, the BoE said.